Make the most of your New York City trip with The Sightseeing Flex Pass. Choose 2, 3, 5, 7 or 10 attractions and visit them at your own pace over a 30-day period. There are over 90 of the best New York City attractions to choose from including One World Observatory, Statue of Liberty, Top of the Rock Observation Deck, museums, tours as well as Hop-on Hop-off bus tours. 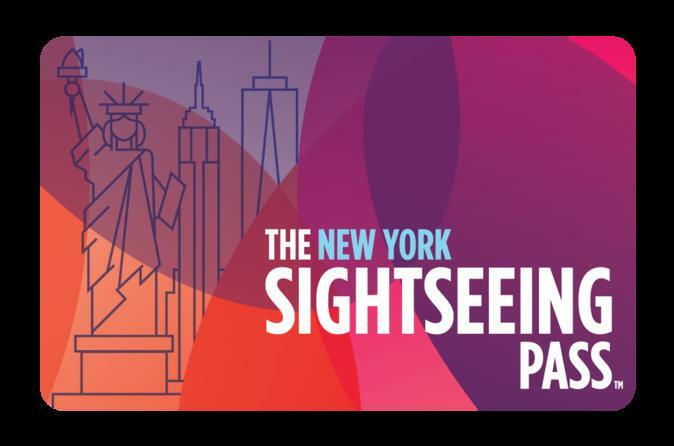 With access to over 90 of the top New York City attractions, museums, tours, restaurants, entertainment and discounts, The Sightseeing Flex Pass New York City is the most comprehensive all-inclusive pass in NYC. Purchase your Sightseeing Pass online and receive it directly via email. With the Sightseeing Flex Pass, you can visit 2, 3, 5, 7, or 10 attractions during a 7 day period. Simply present your pass at any participating attraction to gain free admission. Please note: Each attraction can only be visited once. See NYC wake up from the top of One World Observatory, take the ferry to the Statue of Liberty, head to lunch at Planet Hollywood, see Uptown on a narrated hop-on hop-off bus tour, hop off to see the Intrepid Sea, Air and Space Museum, then head to the Top of the Rock Observation Deck to see city illuminated at night! Special Offer - Book by July 1 to save 7% off our previously offered price! - Book Now!